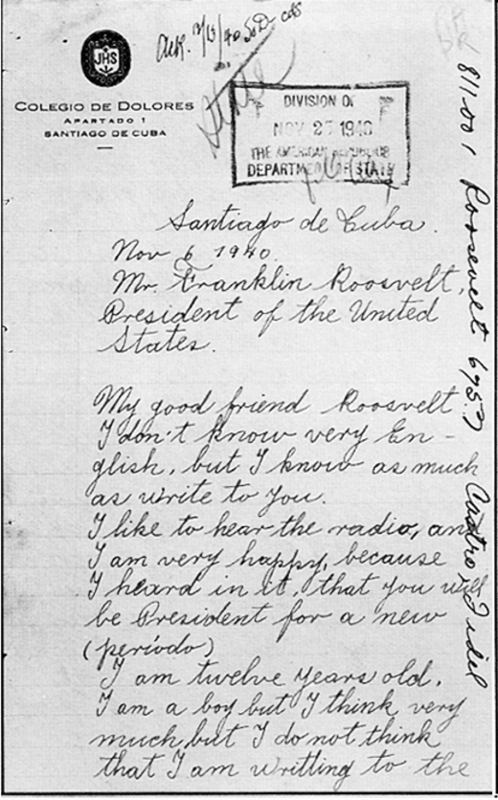 Here is the first page of a letter that is the property of the US government held in US Archives (ARC#30240 Record), written by Señor Fidel Castro at age 14. The letter is transcribed after the photocopy of the page pasted below. It would be interesting to discuss the implications of this letter with a psychiatrist, to see if it foretells his future behavior. Perhaps he hated America so much because FDR failed to send him the $10 he so clearly needed to have. Interesting, too, that he offered to take FDR to see an iron mine in Oriente Province, the seat of the M-267 movement, to make Cuba's natural resources available to the United States for ship building prior to the US entry into World War II. Finally, it is particularly interesting that Fidel lied about his age. In 1940 when the letter was written, he was 14, not 12 as he stated. I suppose the combination of failing to earn $10 or sell iron ore to the US, coupled with his failure to conquer Hollywood six years later (see prior blog), must have contributed to his alienation and descent into the antithesis of capitalism. Part of the joy of writing is the research and the discovery of historical artifacts that did not make it into the history books when I was in school. By the way, the letter was discovered in 1974 among 8 billion documents that had been overlooked at the National Archives. Fascinating bit of history. I am really glad that you shared it with us. Your book has captured my imagination and I have really enjoyed discussing it with you. Keep up the good work. so he wanted a greenback. Now that is Chutzpah. I dont think that FDRs failure to send 10 bucks is the cause of his hatred. Perhaps His hatred came from the mobs in Havana, or the poverty of Cuba compared to the wealth of the Us, or the fact that he never made a MLB team, the BIg Bad Wolf in the neighborhood, or just a crowd pleasing polemic.